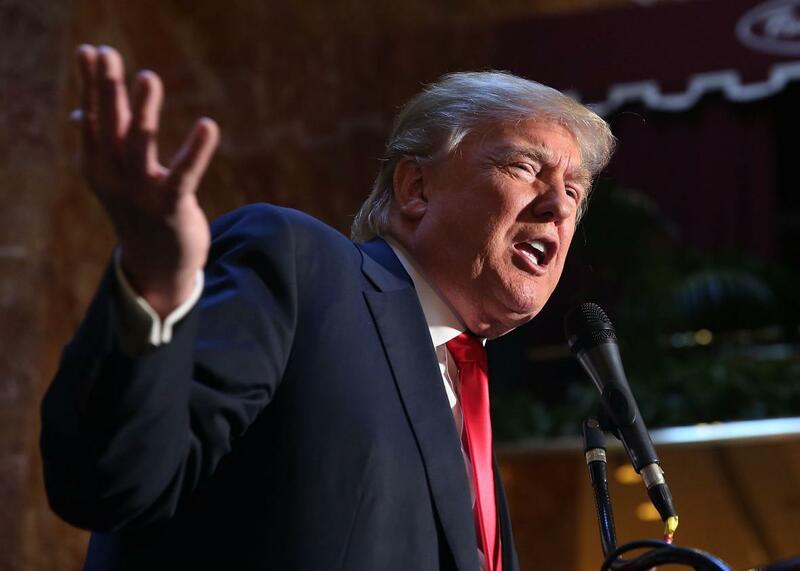 Donald Trump might not have said he wants to register U.S. Muslims. Donald Trump speaks at a news conference before a public signing for his new book Crippled America: How to Make America Great Again, at the Trump Tower Atrium on Nov. 3, 2015, in New York City. As you’ve probably heard by now: Donald Trump appeared to suggest on Thursday that, as president, he would require all Muslims in the United States to register in a database. It was a frighteningly racist proposal—even by Trump’s low standards—and immediately drew comparisons to Jews being forced to register in Nazi Germany. I spent much of Friday afternoon rewatching that clip as though it was the Zapruder film and—I can’t believe I’m about to say this—I think Trump’s technically right: He doesn’t explicitly advocate for creating the database. Yes, he seems to go along with the general idea after the reporter asks him about it—but he also doesn’t explicitly endorse it either. The reporter is asking about Muslims in America, but Trump appears unable to imagine that group includes U.S. citizens, which is probably why he immediately starts talking about the wall—a telling blind spot for a man campaigning on nativist anger and fear. Reporter: Should there be database that tracks the Muslims that are in this country? Trump: There should be a lot of systems, beyond database. We should have a lot of systems and today you can do it. But right now we have to have a border, we have to have strength, we have to have a wall, and we cannot let what’s happening to this country happen any longer. To be clear: There is one right answer to the question of whether the U.S. government should consider creating a database to track American Muslims, and that answer is: no. If Trump wanted to put this issue behind him, all he’d have to do is disavow the idea, but that’s not what he did. Instead, he said, “There should be a lot of systems,” and what remains unclear to me is whether he meant “There should be a lot of systems like a database for all Muslims,” or if he meant “There should be a lot of systems” to keep illegal immigrants out. The reporter is asking about the database, but Trump is talking about his beloved wall, as his very next answer makes clear. Reporter: What do you think the effect of that would be, how would it work? Trump: It would stop people from coming in illegally. Reporter: Would they have to legally be in this database? Trump: They have to be—, they have to be—, the key is people can come to this country but ​they have to be​ here legally. If you clip that quote at “they have to be,” as many outlets including the New York Times and Associated Press did, it reads as though there is no question about what Trump was saying: They have to be in the database. But if you listen to the whole thing, it sounds more like one of Trump’s inarticulate windups. I’m not sure whether or not Trump wants a mandatory Muslim registry, and I certainly wouldn’t put it past him. But I don’t think that’s what he was advocating for in this widely circulated clip. ​Still, the fact he’s open to one—and that so many people were willing to assume he wants one—shows just how terrifying Trump is.​ The racist xenophobe has been leading the GOP national polls for four months and counting.